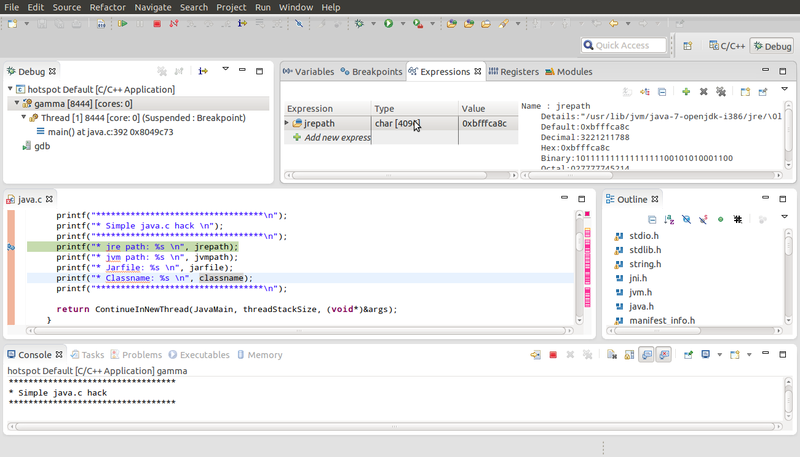 Hotspot™ is in focus again -aka- Hacking Hotspot™ in Eclipse Juno under Ubuntu 12.04! Hotspots, sunspots, solar flares et al have been in the news since the last few months, first a major one in November 2012, followed by another one in January 2013. Whilst I have your attention on this topic, did you know the JVM (Java Virtual Machine) also goes by the name Hotspot™, find out why it is called so! HotSpot. Unlike the sun’s solar hotspots, the JVM i.e. Hotspot™ is a much gentler entity! With the new build system i.e. 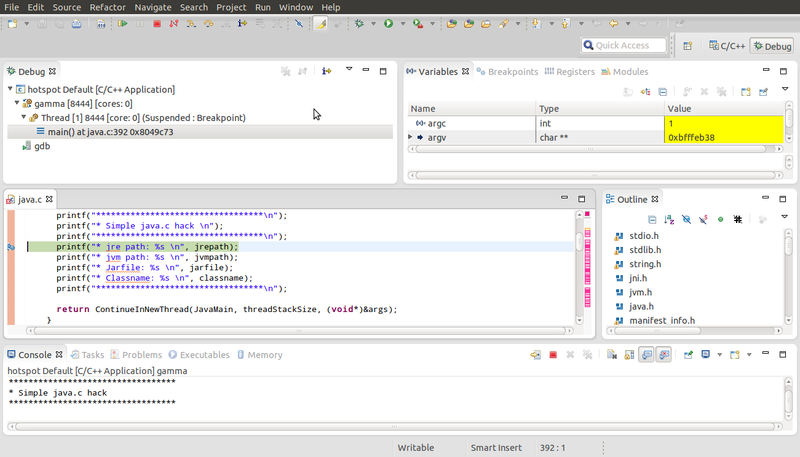 build-infra it is now possible to build and run Hotspot from within Eclipse in a matter of minutes. Further you can even launch your own java-based program using gamma – the Hotspot launcher. The steps are similar to that of building it via the command-line interface (CLI) – but with the advantage of being able to Run and Debug any line in the Hotspot source-code (it is a C/C++ based component of the OpenJDK project). You can also pass in the same arguments as you would to the java command-line. Most of these sections will have screen-shots to illustrate the actions to be taken to achieve the results. We cover only basic aspects of the topic so advanced topics won’t be covered here. Having said that it is a step up from the Old Build system, as in the new Build-infra incremental builds have made things faster. Any class or jar that can be run using the java command. In order to download and install the latest OpenJDK system, follow build instructions at http://java.net/projects/adoptopenjdk/pages/AdoptOpenJDKVMBuild. Please ensure you do not have a previous installation of Eclipse on your system, if you do uninstall it before performing the below instructions. Now add a link to the executable in /usr/bin to “/opt/eclipse/eclipse” for easier access. To do the rest of the optional steps i.e. create a icon in the Unity Dashboard, etc… please refer to the last section of the original blog. 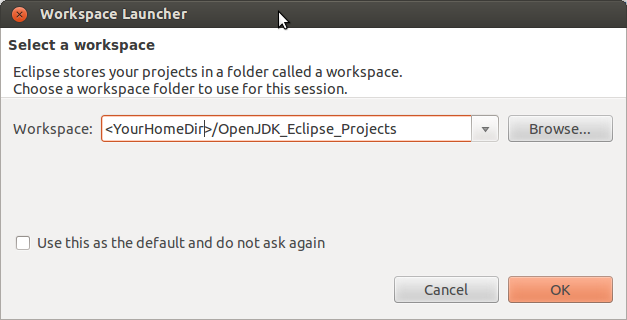 Make it a point to create your own Eclipse workspace for OpenJDK projects calling it something like ‘Eclipse_OpenJDK_Projects’ (without quotes). Once imported, the hotspot project appears in the Project Explorer panel at the left-hand-side. Go to the command-prompt and navigate to where the ‘hotspot’ folder is situated (i.e. ~/sources/jdk8_tl/hotspot). Download takes under a minute and the download progress bar should show 100%. The local copies of .cproject and .project will be overwritten by the above action, along with that the .metadata folder in the Eclipse workspace for the project will also be updated. This should launch Eclipse and take you to your imported project (always launch Eclipse via the script file). Select the project in the Project Explorer and select the menu option Project > Build Project (in case of first-time build from within Eclipse, please do a Clean Build from within Eclipse before doing a full-build). Restart Eclipse using the script mentioned in the above section (see Applying the downloaded…), always launch Eclipse via this script file. Select the project in the Project Explorer and select the menu option Project > Build Project. 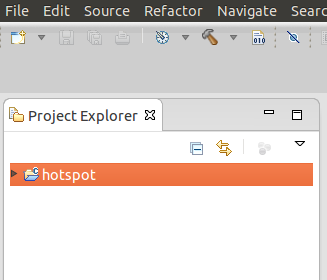 Select the ‘hotspot’ project from the Project Explorer and select the menu option Run > Run. See section “Examining all kinds of logs…” for a detailed version of the above snapshot of the log. Save this program say in the $HOME folder, then edit ../hotspot/eclipseScripts/updateEnvVarsForEclipseForHotspot.sh to enable passing the HelloWorld or any other class to the hotspot program’s Run/Debug Launcher – instructions in the file, look for the below block of code (comment and uncomment the relevant lines). If another name or location is chosen for the demo class or program, then make the necessary amendment in the above script file – comments available in the file to guide you (see below). # export DEMOCLASS_OR_JAR_ARG="-cp $HOME HelloWorld"
See the below section on “Examining all kinds of logs…” for a detailed version of the above snapshot. 1) Insert debug-level log messages into java.c throughout the unit, rebuild gamma and run the Demo class or any other java-based. 2) Refactor java.c and insert debug-level log messages throughout the unit, rebuild gamma and run the Demo class or any other java-based program. 3) After step 2) above, load a low-latency, GC-tuned java based program, with GC-logs enabled and examine the GC-logs produced, to see if there is any change in performance (for performance tuning buffs). 4) Apply the Elvis operator to javac (a good way to get exposure to ‘how to modify javac?’) and compile a java program with the Elvis operator implemented in it. 5) GC-fun: replace the existing garbage collector(s) with a custom one. Resurrect PermGen or iCMS in the existing code. Add your change you always wanted to, to the existing version of Hotspot (for GC buffs). 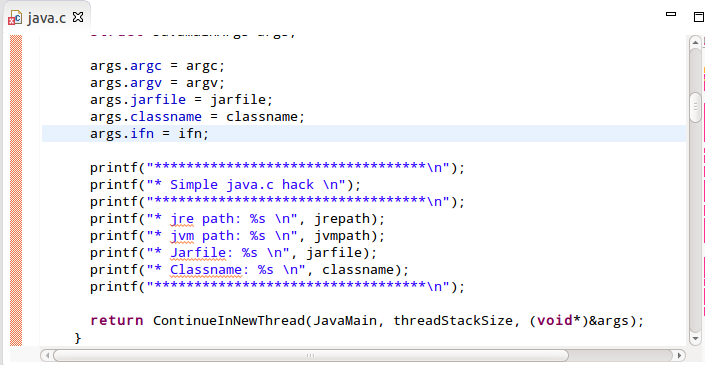 6) Change javac to be able to parse and compile new language features or understand another dialect of JVM-based languages or maybe even older programming languages like C, Assembly, Scheme or Smalltalk. 7) Replace the built-in class-loader with your custom version. 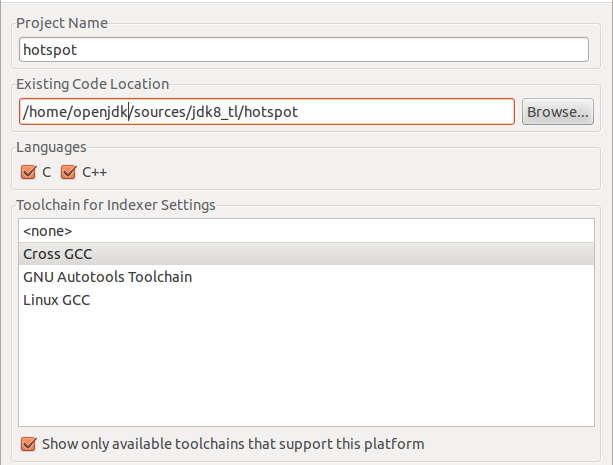 Read about the Adopt OpenJDK program at the the Adopt OpenJDK java.net project website. Join the Adopt OpenJDK mailing list at the google group or send an email to adopt-openjdk@googlegroups.com to subscribe to the mailing list. Find out how to join a Google group. @adoptopenjdk – follow us on twitter, get the latest Adopt OpenJDK community news! Read about the Adopt-a-JSR program at the java.net project website. Join the Adopt-a-JSR mailing list at the java.net mailing list. Send an email to members@adoptajsr.java.net to subscribe to the mailing list. @adoptajsr – follow us on twitter, get the latest Adopt-a-JSR community news! These instructions will be converted to much compact ‘wiki’ instructions without any of the narrations explanations as mentioned in the blog above – “post any feedback and improvements from the users of the instructions!”. You can post them at the bottom of this blog or tweet them to me at @theNeomatrix369. ‘Thank you’ to those who have helped in the process (@karianna, @RichardWarburto, Girish Balakrishnan, @teozaurus, @SamirTalwar, @sandromancuso and @stPundit). Any (constructive) comments or request for changes are welcome. I have learnt a lot about the topics covered here i.e. Java, Eclipse and Ubuntu! For those who wish to dive deeper in Hotspot and Java, make use of all the links in the blog, study the bash scripts written to automate the process, above all look into the hotspot folder and take interest in all the files it contains. Feel free to approach the list of ‘assignment’ hacks, I’ll be more than happy to add links from here to your page if you accomplish any one of them. You will also be mentioned in our community news relayed regularly. You are here because you love and care about software and have a passion for Java/JVM and Web technologies! You are familiar with software, smart devices or even robotics and when you see one you want to take it home! – You are an an inhabitant of planet DevoxxUK ! – You have been to Devoxx conferences before. – Or you can’t make it and sorry about it, but given a chance you would love to come (maybe next year)! – Or maybe even wanting to say “Hi” and encourage others to participate in the event! Just post a message similar to one(s) below with your message, your name, your twitter handle, blog link, a link to your photo (if available), or anything relevant you wish to share with the rest of the community – including details enlisted above. Selected shout-outs will appear in the body of the blog, others will remain in the comments section! Shout-outs will be posted and shared with community far and wide! Shout-outs that stand-out will be highlighted and given focus! Follow DevoxxUK on twitter at @DevoxxUK. DevoxxUK full schedule is out! —- Get your ticket today! 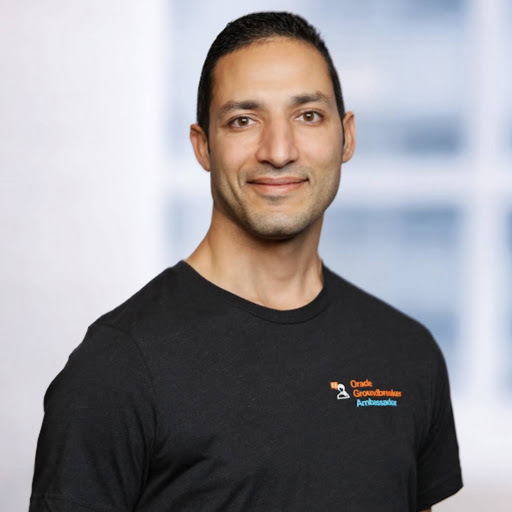 Adopt OpenJDK and Adopt-a-JSR events and speakers at DevoxxUK 2013 – Bring your Java queries realted to JSRs, the JCP, the OpenJDK, excetera to these events. Devoxx UK is a great opportunity for the London Java Community (and beyond) to learn, network and get inspired during this event. It’s also a very nice extension to the already sold out Devoxx Belgium and France editions. Attending a conference by developers for developers (at a very democratic price) can really bring value to your career. Of course the things you learn and pick up but more importantly the peer-to-peer contacts & conversations often inspire you to take your ideas (and even your code) to the next level. Enjoy our first Devoxx UK edition. We are really looking forward to DevoxxUK. Great to get the conference over here and for the LJC to have such a big part in it. At RecWorks we are always encouraging developers to engage with the community, learn more and get involved in what’s going on. DevoxxUK seems a perfect place to do that and at a price point that is open to everyone. See you at the LJC stand! I have been to several Devoxx conferences (in Belgium) and to several other conferences all over Europe as well. I’m even going to be a speaker at Devoxx UK this year. So if you’re interested in creating Word/Excel documents with Java, come to my quickie. I’m also going to be co-host of the Duchess Women in IT BoF and maybe you’ll find me on a panel about teaching kids how to code. Needless to say, I’m obviously very excited about Devoxx UK! Devoxx has always been the premier Java conference in Europe and it’s a fantastic opportunity for Londoners to get a piece of that. I’m particularly excited about some of the deep dive and topical talks on Java and Cloud security, and the Hands on Labs for Java EE7 and Java 8 are also major highlights for me. Get your ticket today! DevoxxUK is going to be my first proper software conference where I’m involved with the top brass (if I may) and their supporters, from world of developers ! The two days of DevoxxUK will be filled with excitement, throwing a lot of attention on technologies that developers are passionate about, that make them proud and that they hold close to their hearts ! Remember it is an event for developers by developers, for the community by the community. In the last so many years, the age range of developers have breached its limits again-and-again – today we have kids (Devoxx 4 Kids) as young as 10 are being introduced to robotics, smart devices and programming. But lets not forget the veterans of the software industry in their 50s and 60s who have left behind system-level and functional languages for us to cherish! DevoxxUK is hosting and welcoming many such inhabitants from a growing and maturing planet of developers and creators of our past, present and future! Great event!!!! I would like to go there this year!!! The first time I heard about DevoxxUK was during Devoxx 2012 in Belgium. I’ve got immediately excited! No doubt that it´s going to be a great edition! I will attend on behalf of CEJUG (cejug.org) and my goal, besides attending all those great conference sessions, is to get in touch with AdoptOpenJDK and AdoptaJSR folks! Those guys are doing a great job by moving Java forward! CEJUG Community heavily supports these initiatives! 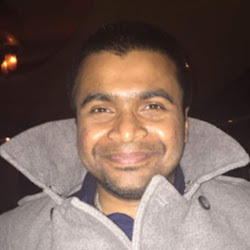 Yes CEJUG has the passion for java / JVM and Web technologies ! Manda Bala DevoxxUK (“Go go go DevoxxUK“) !!! É uma excelente oportunidade para a nossa comunidade (CEJUG) absorver um conteúdo tão bem elaborado para a rotina atual e corrida de um desenvolvedor. Desejo que os participantes aproveitem ao máximo o partilhar dos “Caras do desenvolvimento” e estreitem laços entre outros desenvolvedores de uma forma qualitativa e eficaz. De fato é um evento da comunidade para a comunidade! It is an excellent opportunity for our community (CEJUG) to absorb content as well prepare for the development of the future of a developer. I wish the participants make the most of the presence of you “developers” and establish closer links between other developers in a qualitative and effective manner. In fact it is a community event for the community! I am so exited to know about this great conference, I was looking forward to participate in this year Devoxx UK, but I participated in Devoxx France but I have submitted lately and also for my bad chance it only has a limited slots for English sessions. This conference gather the top quality speakers, some of them I know well, specially for their high activity and professionalization in JCP as we worked together in adopt-a-JSR program. Mani Sarkar, Somay, Hildeberto Mendonca, Arun Gupta, Adam Bien and Martijn Verburg. Being part of Devoxx UK is very important to me. Not every developer works for a company that can afford to send them on expensive overseas or local conferences. And that’s where Devoxx is different, we strongly believe in catering to and the support of the local communities and want to offer a real value for money experience in the heart of London – home to 1000s of developers. Naturally I’m also really excited by the content; it’s one thing to be able to read things in blogs, it’s another to have a dynamic and engaging speaker serve up novel or challenging ideas like a pro at Wimbledon. So make sure you get a ticket and grab a seat in the front row! xxxxxxxxxxxxxxxxxxxxxxxxxxxxxxxxxxxxxxxxxxxxxxxxxxxxxxxxxxxxxxxxxxxxxx xxxxxxxxxxxxxxxxxxxxxxxxxxxxxxxxxxxxxxxxxxxxxxxxxxxxxxxxxxxxxxxxx xxxxxxxxxxxxxxxxxxxxxxxxxxxxxxxxxxxxxxxxxxxxxxxxxxxxxx xxxxxxxxxxxxxxxxxxxxxxxxxxxxxxxxxxxxxxxxxxxxxxxx xxxxxxxxxxxxxxxxxxxxxxxxxxxxxxxxxxxxxxx xxxxxxxxxxxxxxxxxxxxxxxxxxxxxxxxxxxxxxxxxxxxxxxx xxxxxxxxxxxxxxxxxxxxxxxxxxxxxxxxxxxxxxxxxxxxxxxxxxxxxxxxxxx xxxxxxxxxxxxxxxxxxxxxxxxxxxxxxxxxxxxxxxxxxxxxxxx xxxxxxxxxxxxxxxxxxxxxxxxxxxxxxxxx!